They were a reminder of the beauty of England. Violets, geraniums, primrose and dahlias mixed with herbs. Medicinal Echinacea, yarrow, tansy, chives and dandelions — the first greens after a long winter. Honeycomb, a one patch quilt, was made of hexagon patches sewn together without any attempts at colour arrangement. But few quilts were random. The six sided patches demanded experimentation at the hands of the colour-loving women who worked with them. Even the oldest tattered remnants of hexagon quilts show attempts at arranging colour. In time, more elaborate mosaic patterns evolved. A typical pattern as featured on the Semowniuk barn shows a centre circled by six contrasting hexagons and another twelve around that, and a fourth circle of 24. The yellow centre represents a flower’s centre surrounded by petals; then a background of green representing the garden; followed by white reminiscent of the picket fences of English gardens. This pattern mimics the amazing honeybee hive — six-sided cells filled with sweet golden goodness — perfectly shaped architecture serving the purpose of reproduction and food storage. Bees were brought to this area by the Moravian Delawares in 1793 from the USA for pollination and honey products. The honeybee soon escaped man and made new homes in the backwoods across North America. Settlers learned how to find these “bee trees”. Some even became professional bee hunters. On hot summer days Grandpa, Dad and I would take some wax and honey and melt it on a stone. Soon some bees would appear and we followed them to the hoard. Sometimes we smoked them out, robbing them of their honey. Other times we cut down the tree and sectioned out the trunk where the bees were using it as a hive. 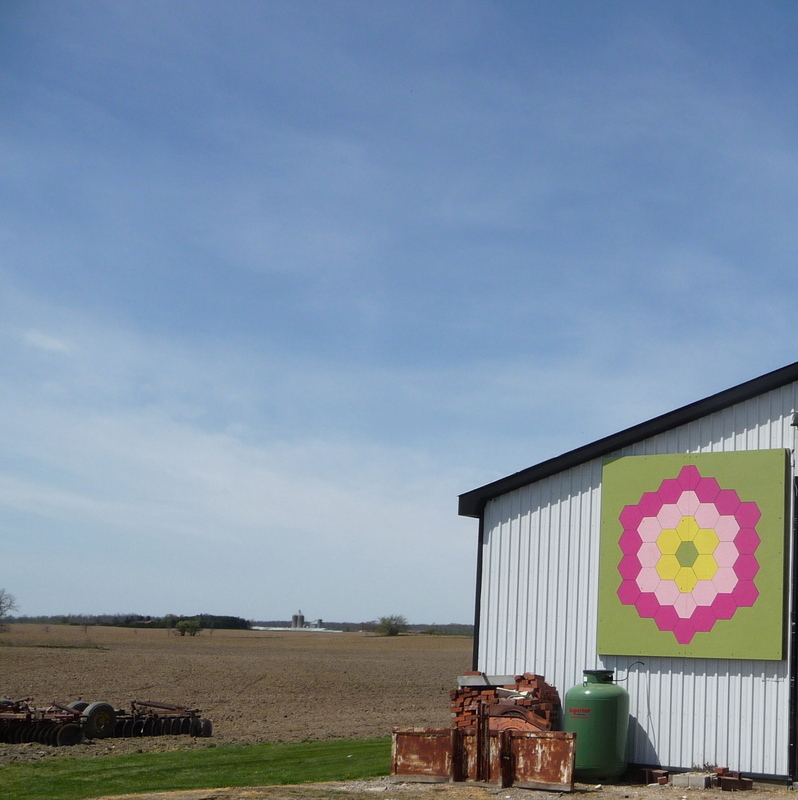 Grandmothers Flower Garden is one of our best loved vintage quilts but very few new ones are made. This is a very labour intensive quilt pattern usually pieced and quilted by hand.